Group tour packages specializing in guided holidays are a boon to travellers. The group tour packages for Andaman have been customized to provide the best of comfort and show you the best of the island beauty in the best of budget. Situated far away from the Indian mainland into the Andaman Seas or in the Bay of Bengal, this archipelago is considered to be the most romantic holiday destination in the Indian subcontinent. The tranquil beaches and the amazing hospitality of the local people inhabiting these islands make this destination a true pleasure to visit. When we think of Andamans, we think of the wonderful beaches, the amazing seas, the adventurous water activities, the mouth-watering dishes, the historic monuments, the wildness of the national forests, the mud volcanoes, the limestone caves, the thousands of parrot inhabiting the uninhabited and mysterious Parrot Island, the fascinating turtle breeding sandy beaches, the dark secrets closely guarded by the ferocious ancient tribes of the Sentinelese and Jarawas, Onges and Nicobarese and so much more. Group tour packages carry a lot of benefit. They are designed to provide the best of experience within a strict budget. You get a lot of other like-minded travel partners to share the joys of your experiences. You get to share your knowledge and gather relevant additional information about the rich cultural experiences of others. Touring the uncharted destinations of India in a group is a completely different and wilder experience. You get to meet a lot of new people coming from all across the globe united by the single passion of harnessing the joys of travel. Group holiday packages offer the benefit of seeking help in any need while on trip. You shall never feel alone or helpless. On the contrary, the vacation becomes all the more captivating with all the stories of experiences pouring in from all corners. Catch the unique and authentic experiences of the heart of the island. Enjoy the festivals of the localites, the food, the culture and experience the life so different from yours in these remote islands. Get to see how the villagers live among the abundant beauty of nature amidst their fair share of inconveniences. 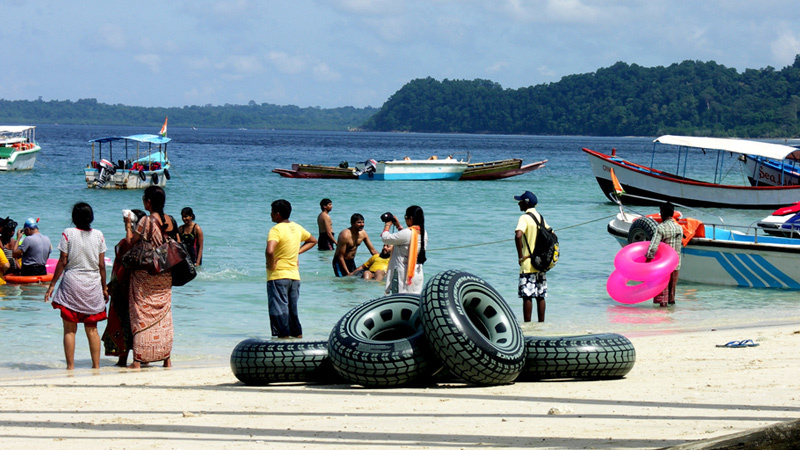 Group tours to Andamans will take you through the wondrous wilderness of the thick forests and the solitude of the vast stretches of white sandy beaches. You can enjoy these custom-tailored vacations in all times of the year. In the summers, enjoy the cool sea breezes, pleasant boat rides, dives into the sea waters, the plentiful water sports and the lovely beach sunsets and sunrises. In the winters, enjoy the mild coolness of the atmosphere and escape the harshness of cold climes. You will only gain an ocean of knowledge, pleasure, experiences and memories through a mirthful group tour in these beautiful islands. Book cheap discounted Group Packages for Andaman and Nicobar Islands from Delhi, Mumbai, Chennai, Hyderabad, Kolkata, Ahmedabad, Pune and Bangalore.